← Too cute not to share. This has got to be one of my favorite recent pictures. He wasn’t really dancing, but looking at his hands and arms. He’s getting so big, that I take a million pictures of him. He has become a camera hog as well. He always stares right at the camera or climbes right up to it. BIL fixed the computer cord yesterday, so I’m able to at least play on my computer. I tried to give Mr. Blue Eyes some peas yesterday. Poor baby had hives on his face. Apparently we don’t do peas in this house. I can’t say I’m heartbroken, both my hubby and I hate them. That’s the first food I’ve seen little man have a bit of a reaction to. Maybe we’ll try them again when he’s older. If not, it won’t break my heart. Yesterday I went out for a little while. I really just needed out of the house. Nothing against BIL but I told him my dogs were too smart to leave out in the backyard while I walked around the stores. But he left them out there anyways. As we got home, I see three tails running back to the house. The back gate was standing wide open (Blackjack can open it) and they were filthy! Who knows where they went. Thankfully Blackjack always comes back, and since he is the ringleader we got the others back. I was worried when we only saw three tails. That means one little one is not here. After putting Baby Blue in the stroller and starting to search everywhere, BIL goes into the backyard to put the other pups away. There’s his pup sitting right at the backdoor. Thank goodness!!! I always said Blackjack was my Houdini. Always escaping before I knew what to do. Thankfully Domino is too little even if he knows how to escape. I’m worried about Bear and Gamble though. They are both smart, and Gamble will be a lot bigger than Bear, and with them both being smart I’m afraid my Houdini days are not over yet. I had all of these big plans for Hubby’s underway, but as I said before Mrs. Murphy decided to come for a visit. Now I’ll be lucky if I can catch up on laundry and some of the house work. I had hoped to clean up our guest bedroom so we can put some carpet in there soon. I’d also hoped to get some of the painting done on the front of the house since its finally cool enough that the paint can go on the house now. Maybe I’ll be able to get some of the house painted. We’ll see. Other than that, we’re planning one more bbq while the weather is still wonderful. The puppies get their final shots soon, then I can take all four back to the dog park. That will be a nice little outing. I’m going to have to get Mr. Blue Eyes some shoes if I want to. There is no way he’ll be happy in the stroller anymore. 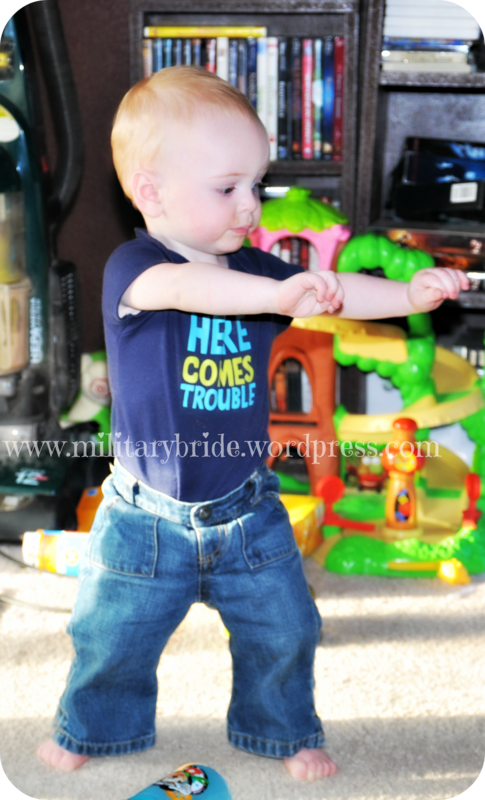 Posted in Baby, dogs, family, hubby, life, military family, milspouse, pets and tagged babies, baby, baby boy, dancing, life, military family, military life, pets, Pets are kids too, photo, photography, puppies, runaway, son, spouse, wife. Bookmark the permalink.